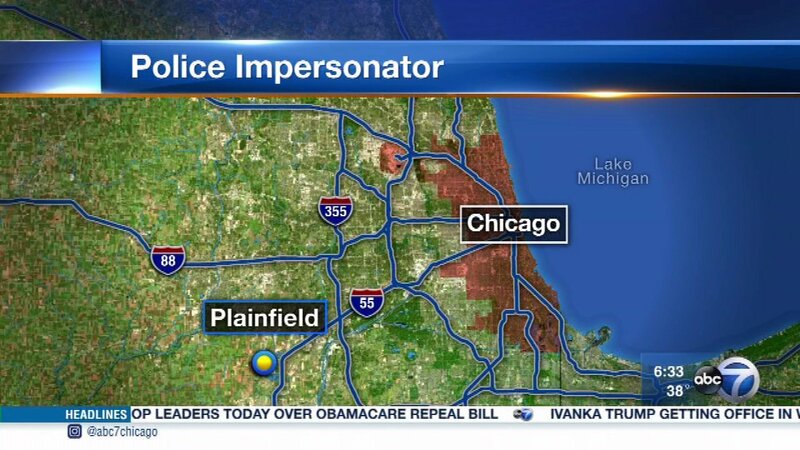 PLAINFIELD, Ill. (WLS) -- The Plainfield Police Department issued a warning about a man impersonating an officer in the southwest suburb. A woman told police she was approached just before 10 p.m. Friday by a man in a police uniform as she left a Little Caesar's Pizza in the 13300-block of South Route 59. She said he also has a gun and a radio. He identified himself as a Plainfield officer and asked her for identification, police said. She grabbed her license from her car and showed it to him. Police said he then asked her for a second form of photo ID, which she also showed him. The man then said he would write her a ticket. Police said when she asked why, he said he wouldn't write the ticket if she gave him her phone number. The woman walked to her car and left. She told police she saw a patch on the man's sleeve that she didn't recognize, and said it was not a Plainfield police patch. Police said the man was white, in his early 40s and had short, dark hair. He was about 6 ft. tall and weighed around 200 pounds. Investigators are looking into what happened. Anyone who has information pertinent to the investigation should call Detective Sergeant Kevin McQuaid at 815-267-7209.